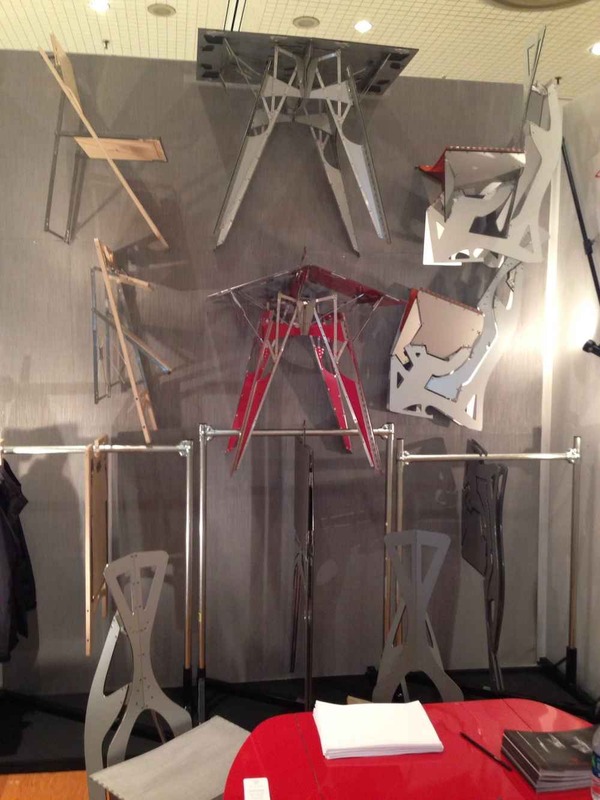 The International Contemporary Furniture Fair (ICFF) is going on in New York City this week. This is the third year in a row that I’ve attended, and while there has never been a shortage of beautifully crafted and designed furniture, the small space offerings have been pretty meager. 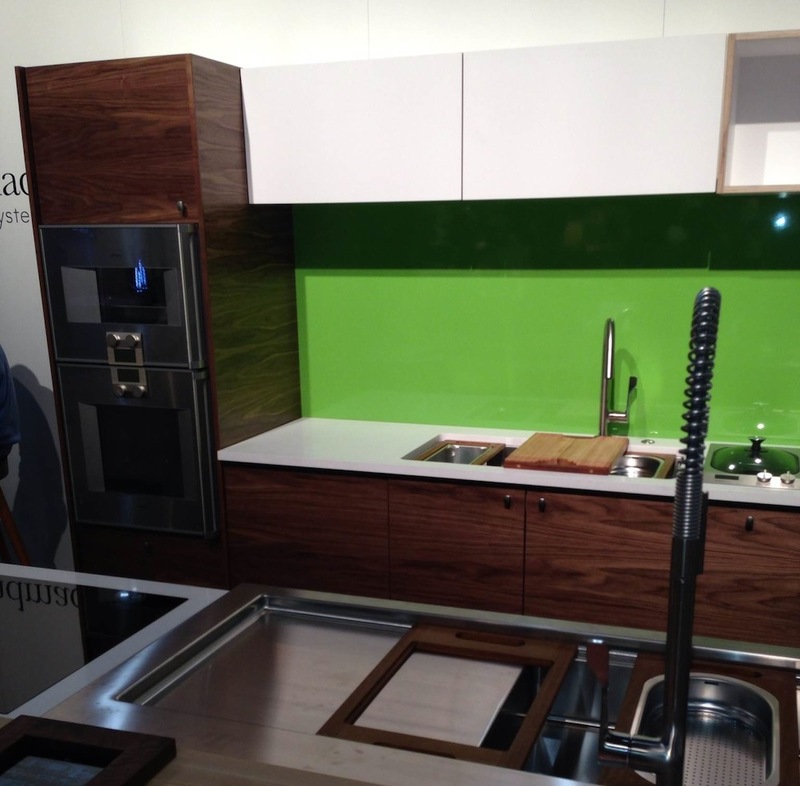 ICFF exhibitors seem focused primarily on customers with unlimited budgets and square footage. With the growing popularity of micro-apartments and small space living, I fared forth in high hopes this year. Unfortunately, the small-space offerings–with the few exceptions noted below–were few and far between. The fact is there is still big money in big spaces. There were, however, a few things that piqued my interest. 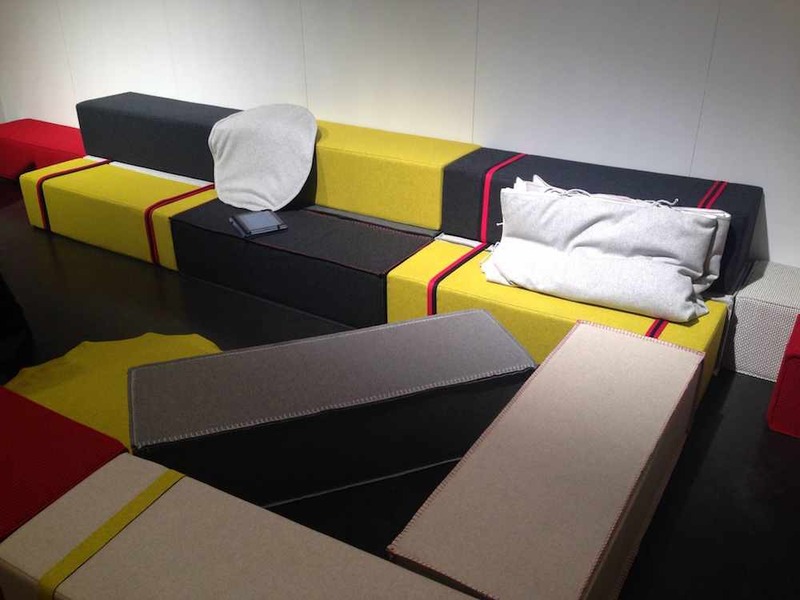 One of my favorite items was a modular piece of furniture by the company Cezign. It’s not small space designed per se, but the design could adapt to any space. The all-American made rectangles are covered in beautiful wool felt and can be configured in many different ways–from a bed to couch to…whatever. One small drawback (don’t laugh): They retail for $900…each. Considering you’d need three to six to make a functional piece of furniture, that’d add up quick. 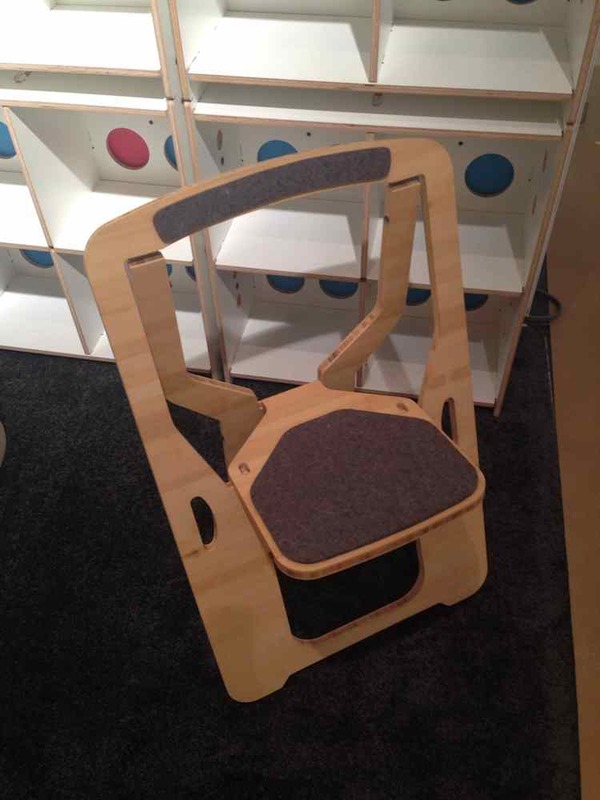 Folditure–the exotic looking, super-thin-packing furniture company–has a new chair called the Tilt. When folded, it’s a mere .62″. The Tilt is slightly more conventional looking than the company’s other offerings. While the aesthetics might not be everyone’s cup of tea, the chair felt solid and its ability to hang in a closet is pretty nifty. 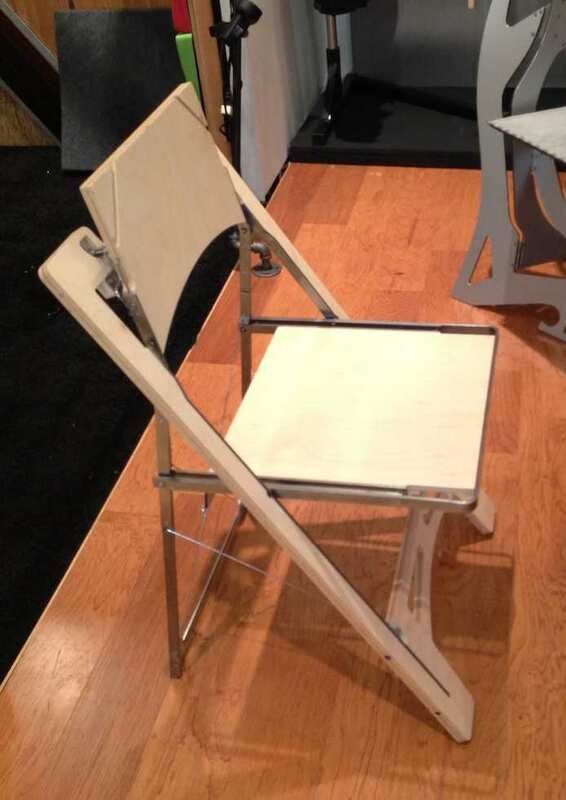 A company called Monstrans offered another flatpack chair made of bamboo ply. I was a bit suspicious of its sturdiness so I asked their representative about its weight load. He responded that it’s sold as an art piece, meaning it might not be the best seat in the house for your bigger friends. He did say that the chair has been subjected to a couple years of heavy use without problems, and it did feel solid. Semi-Handmade makes high quality replacement doors for IKEA cabinets, which is to spaces big or small. When building the LifeEdited apartment, by far the most expensive material cost was the custom cabinetry. We know IKEA stuff isn’t the world’s best, but their prices are so compelling that many of us end up using the big blue’s cabinets anyway. Semi-Handmade’s doors feature natural veneers like walnut and reclaimed barn wood on top of MDF. They look pretty decent and with prices starting around 30% more than IKEA’s top of the line stuff (which aren’t that expensive), it’s can save you a ton over custom, while achieving a custom-quality look. Obviously this would work well for kitchen cabinetry, but also built-in cabinets for a small space. 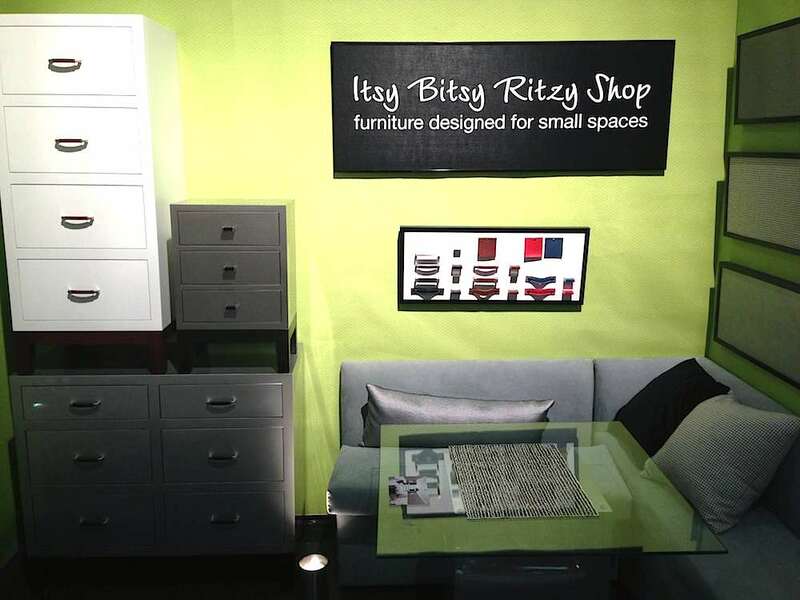 Finally, there was Itsy Bitsy Ritzy Shop. As you might be able to glean from their name, IBRS makes high end furniture proportionate to small spaces. They make shallow banquettes with storage, tiny sofa beds, modestly proportioned dressers, under-bed storage drawers and more. On their site, they feature a fully functional 216 sq ft room–a sign that they are serious about small. Their furniture is all made in Connecticut out of solid wood (I didn’t catch the prices, but imagine they’re steep). What’s cool about IBRS is they treat small spaces as a legitimate places to live–not simply places to jam hand-me-down, oversized crap. This seriousness, we hope, is a sign of things to come. This is by no means a full report of all the great stuff at ICFF–just one with the small space in mind. Let’s hope next year brings even more interesting designs for the compact home. 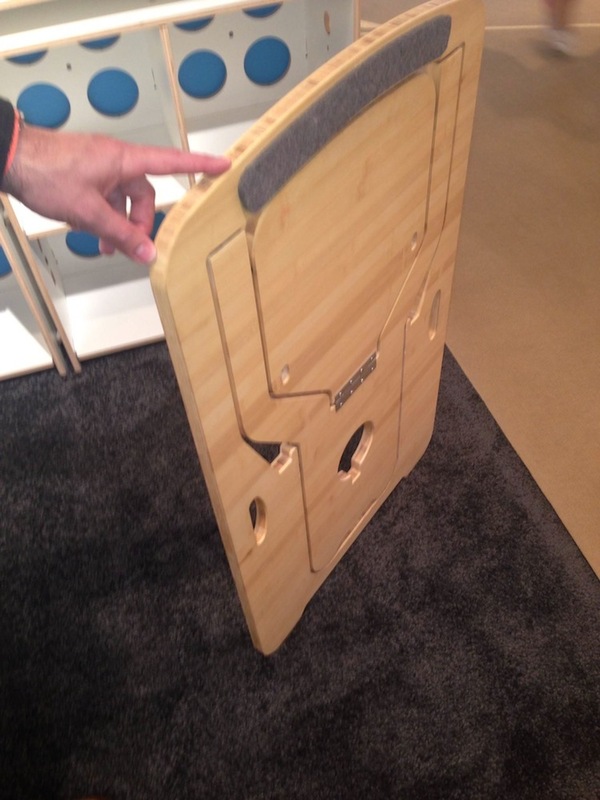 Thanks so much for stopping by our booth at the ICFF. We do not have a complex business model. In fact we’ve got quite an old fashion value proposition: high quality, versatile furniture at an affordable price point. As a private business we don’t have to worry about maximizing shareholder value or our driving down our costs of goods and services for quarterly earnings calls. This allows us to pass along greater value in exchange to the end customer. In contrast, a typical furniture company marks up their products 3 X, 4 X or sometimes even 5 X. Shareholder interests for quarterly performance put pressures on driving their costs of goods and services as low as possible to maximize a gross operating margin. We’re focused on the long game. Our pursuit began when our co-founder Marcia (a practicing interior designer) could not find anything on the market that was well-designed, appropriately scaled, served multiple uses and most importantly built to her exacting quality standards. Unlike some of our larger competitors we do not source tropical hardwoods from Amazonian rain forests and grind that wood up into particle board. We do not ship this low quality building material to a low cost manufacturing facility located someplace in the Developing World, where the ethical treatment of the workers is questionable. We do not ship the product to a distribution center. It doesn’t go back overseas to an American warehouse where it sits in cold storage until the inventory levels on the shelf at some big box retailer get low. Of course, I’m oversimplifying a bit, but we did think it was a bit crazy for a piece of furniture to travel more over its lifespan than its owner. We decided to build our products with local materials and labor. Contributing to our local economy and enfranchising a local base of skilled workers is important to us. And as we grow our business and scale, we aim to do so responsibly. This means being mindful of the carbon footprint in our supply chain. We started with a team of master craftsman and developed a whole series of prototypes, which later turned into two entire lines (Modern & Classic) and several collections inspired by the color stories from four upscale American cities. All of our hardwood and upholstered furniture is hand crafted in Connecticut and built to last for years. Each piece is made-to-order. Our hardwood furniture uses solid maple with English dovetail drawers and five side construction. These epitomize the best quality artisanal craftsmanship. You get made-to-order quality furniture without having to pay exorbitant made-to-order prices. We actually do think what we offer is quite affordable given all of the aforementioned touch-points in terms of quality, craftsmanship and carbon footprint. Sadly many of the larger companies are not transparent about their materials or manufacturing process with their clients. And we think the average person can make a huge, positive impact on the US economy, with each and every purchase decision. It’s all about giving people a better choice than what’s presently available.